Side view of column on folio 40. ‘Side View’. bl.uk > Online Gallery Home	> Online exhibitions	> Asia, Pacific and Africa Collections	> Side view of column on folio 40. ‘Side View’. Watercolour drawing of the side view of a pillar with a lion base, taken from an Album of 56 sheets of drawings (60 folios) mainly of miscellaneous architecture and sculpture in the Deccan and S. India, dated 1793-1806, from the MacKenzie Collection. 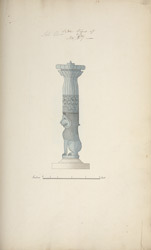 This drawing depicts a column with a lion base, typical of Pallava architecture of Tamil Nadu and is found in numerous cave temples erected under the two Pallava rulers Mamalla (c.630-68) and Rajasimha (c.700-728).